The new series of Doctor Who gets off to a sensational start. 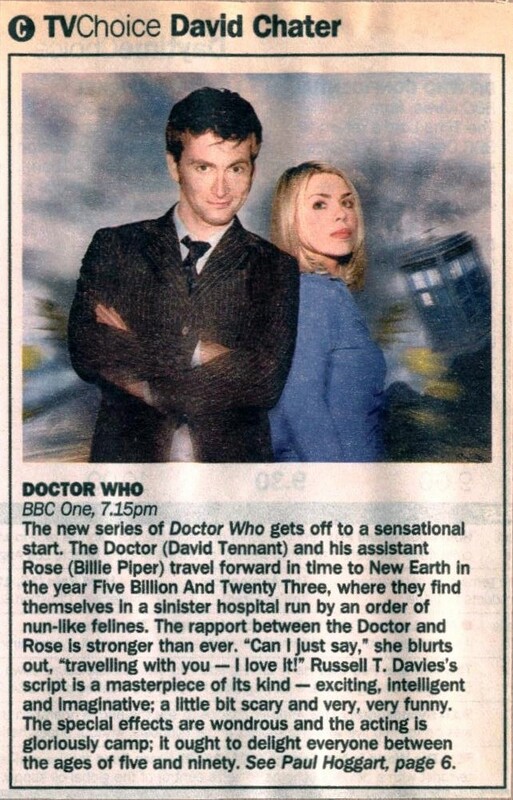 The Doctor (David Tennant) and his assistant Rose (Billie Piper) travel forward in time to New Earth in the year Five Billion And Twenty Three, where they find themselves in a sinister hospital run by an order of nun-like felines. The rapport between the Doctor and Rose is stronger than ever. "Can I Just say," she blurts out, "travelling with you — I love It!" Russell T. Davies's script is a masterpiece of its kind — exciting, intelligent and imaginative; a little bit scary and very, very funny. The special effects are wondrous and the acting is gloriously camp; it ought to delight everyone between the ages of five and ninety. See Paul Hoggart, page 6. APA 6th ed. : Chater, David (2006-04-15). The new series of Doctor Who gets off to a sensational start. The Times . MLA 7th ed. : Chater, David. "The new series of Doctor Who gets off to a sensational start." The Times [add city] 2006-04-15. Print. Turabian: Chater, David. "The new series of Doctor Who gets off to a sensational start." The Times, 2006-04-15, section, edition.